A La Nina pattern may bring storms this winter. It is not officially winter yet, even if it feels that way. 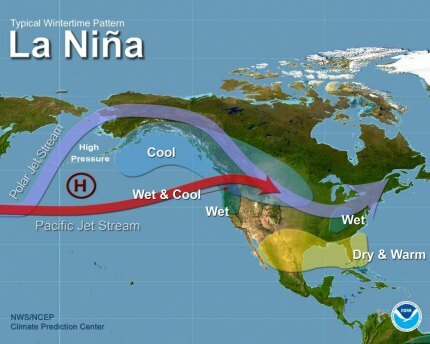 And at the bottom of it is a weather pattern known as La Nina. What does it mean for winter weather? It’s a mixed bag, according to NOAA: More precipitation and colder temperatures along the northern tier of the U.S., while the South could see drier conditions. So, what is El Nino? In Spanish, it means “the boy.” It is a weather pattern resulting from variations in ocean temperatures in the equatorial Pacific, according to NOAA. Meteorologists sometimes refer to La Nina as the “cold phase” of the El Nino-Southern Oscillation cycle, the website explains. An El Nino is the warm phase. Do these events just affect the Pacific? It was once believed that an El Nino or La Nina would primarily impact areas in the eastern Pacific. But researchers now believe both can affect weather and climate patterns thousands of miles away, according to the North Carolina State University website. What’s with the names? El Nino is also a reference to the Christ child, the National Weather Service points out. The weather pattern was given this name by fishermen in the 1600s, probably because the event occurred in December. How long does a La Nina or El Nino last? It varies. Episodes run nine to 12 months, but sometimes longer. Do scientists fully understand these patterns? They are still learning. Recently, researchers at the University of Texas at Austin reported that new studies had improved scientists' ability to predict the strength and duration of droughts caused by La Nina. The research may help scientists know years in advance how a La Nina event is expected to evolve, according to the university. Is it a blizzard or just a winter storm?